I wrote this story in 2014 for Farm News and wanted to share it again today on this 15th anniversary of the 9/11 tragedies. We must never forget, or take our freedoms for granted. Ginger Tribby doesn’t do a lot of cooking. 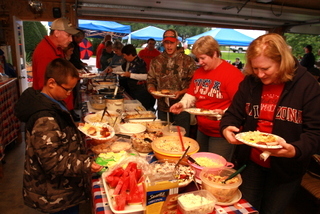 That doesn’t mean that incredible home-cooked food doesn’t abound, however, when she and her husband, Neal, host a potluck at their home each Sept. 11 to remember the day America changed forever. “It’s about a ppreciating our life, our freedom and all the blessings we have in America,” said Tribby, a retired Farm Bureau Financial Services employee. The passengers were later told that their flight had been cancelled due to the closing of U.S. air space. Amidst the fear and confusion, a fellow passenger with a cell phone was able to find out what was going on. “It was totally surreal,” said Tribby, who wasn’t able to return to the United States with her family until Sept. 15. Want more fun Iowa food stories and recipes? Check out my top-selling “Culinary History of Iowa” book from The History Press, and order your signed copy today. 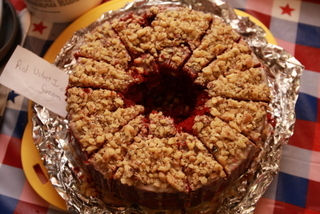 This family favorite comes from Ginger Tribby’s mother, Ellen Dooley. 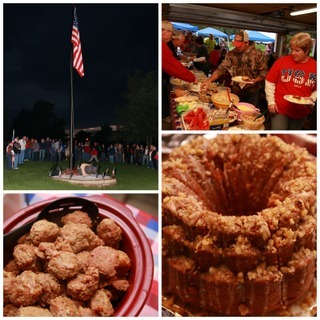 Ginger and her sisters made a triple batch for this year’s Sept. 11 remembrance gathering. Combine all the ham ball ingredients. Shape into balls about the size of golf balls, and place in baking dish. Combine the syrup ingredients and set aside. Bake ham balls at 350 degrees for 30 minutes. 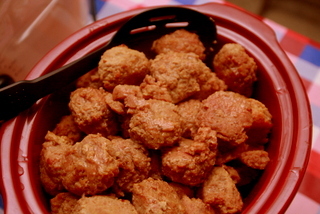 Top the ham balls with syrup, and bake another 30 minutes. 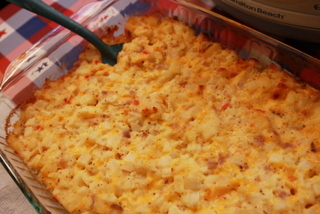 This recipe from Joanne Gavin of St. Marys is always a hit at potlucks. Mix all ingredients together. Bake in an uncovered 9-inch by 13-inch dish at 325 degrees for 1 hour. This classic recipe is found in the “Great Home Cooking” cookbook compiled by members of the Immaculate Conception Parish in St. Marys. Mix Miracle Whip and sugar together with an electric mixer; set aside. Cook macaroni until tender. Drain and rinse in cold water; let cool. Combine Miracle Whip mixture with macaroni and all remaining ingredients. Refrigerate for two hours before serving. Makes 10 cups. This easy recipe from the Tribby’s friend Sheryl Reynolds of Des Moines tastes great with ice cream or whipped cream. It also freezes well. With a few minor adjustments (noted below the recipe here), it can be transformed into Red Velvet Irish Cream Cake. Preheat oven to 325 degrees. Grease and flour a 12-cup Bundt pan. Sprinkle nuts on the bottom of pan. Combine all cake ingredients. Beat for 2 minutes on high with electric mixer. Pour into prepared pan. Bake for 1 hour. Cool in pan. Invert onto serving plate. Prick top with fork. For glaze, combine butter, water and sugar. Boil 5 minutes, stir constantly. Remove from heat, and stir in rum. Note: the rum will cause steam, so be careful not to burn yourself. Drizzle glaze over top of cake. Use brush or spoon to put extra drippings of glaze on cake. To make Red Velvet Irish Cream Cake instead of Rum Cake, substitute 1 18.25-ounce box of red velvet cake mix instead of yellow cake mix. Also substitute 1 / 2 cup Irish Cream in the cake batter instead of rum. Follow all the same steps to prepare the cake. For the glaze, substitute 1 / 2 cup Irish Cream instead of the 1 / 2 cup rum. Follow all the same steps to prepare the glaze. This recipe is a favorite of the Tribby’s neighbor, Holly Wiederin, who noted that it can be made with any berry or stone fruit. She likes to use pitted, tart cherries. This recipe makes one 17-inch by 12-inch sheet pan of bars. For crust, process half of each of the flour, salt, and sugar in a food processor until combined. Add half of the butter. Pulse until mixture resembles coarse meal, about 10 seconds. With machine running, add about half of the ice water in a slow, steady stream just until dough comes together. Turn dough out onto a piece of plastic wrap. Flatten dough, and shape into a rectangle; wrap in plastic. Refrigerate at least 1 hour or overnight. Repeat process with remaining ingredients – you need two discs of dough to make the Slab Pie Bars. For the bars, preheat oven to 375 degrees. On a lightly floured surface, roll out a larger piece of dough to a 20-inch by 15-inch rectangle. Fit into a 17-inch by 12-inch rimmed baking sheet, pressing into corners. Pastry will hang over sides. Chill while assembling filling. In a large bowl, stir together berries, sugar, cornstarch, lemon juice, and salt. Spread mixture over chilled pie shell. On a lightly floured surface, roll out remaining piece of dough to an 18-inch by 13-inch rectangle; drape over filling. Fold edge of bottom dough over top dough. Pinch edges to seal. Prick top dough all over with a fork. Brush entire surface of pie with cream, and sprinkle with sanding sugar. Bake until crust is golden brown and filling is bubbling, 40 to 55 minutes. Transfer to a wire rack, and let pie cool. Serve warm or at room temperature. Slab Pie Bars are best eaten the same day they are baked but can be kept at room temperature, loosely covered with plastic wrap, for up to two days. Slab Pie dough can be frozen for up to 1 month.